Stories have formed the basis of all learning ever since the human race came into existence. We have all learned through myths, legends, movies, Grandma’s bedtime stories, and so on. Stories leave a lifelong stamp on our minds, and are therefore very effective tools in improving enduring understanding. Moreover, telling a story involves a much higher order of thinking skills than listening to one. In this age, the art of storytelling remains – it is only the packaging which has changed for a 21st century learner. The students of today are fortunate to have an ocean of resources to choose from in the form of tech tools for telling their tale. Here are a few of my experiences with my little storytellers. In another instance, year 1 students used stories to sum up their unit under the same theme, with the central idea that authors share their ideas, beliefs and values through their writings and illustrations. They all became authors and illustrators for their books. They used the Book Creator app for writing their stories. As they learnt in the class that illustrations are most important for making a story meaningful, they all used Doodoo Lite, a scratch painting application for drawing their illustrations. It was a whole lot of action in the ICT room as the students were immersed in drawing and erasing on the iPads and inserting their pictures on to Book Creator, or typing their stories and trying to figure out spellings. Year 5 were also encouraged to write stories of their own. They went through a long step-by-step process of planning, writing, editing and publishing to reach their final stories. They used the Tree Tops Story Writer to make skeletal plans of their stories: the plot, setting, characters, stages, climax, etc. Once their plans were ready, they shared them on the “story writers” group on Edmodo to ask for feedback from their friends. It was a very fruitful peer assessment exercise. Keeping the plan handy, the students started off with the writing. It was a continuous back and forth of checking and editing between them and me. Finally, after a span of a few days, they were ready to publish. To publish their books, they too used the Book Creator App, in which they also added some illustrations from the Internet and most of their reflections say that “that was the best part”! Do you incorporate storytelling into your students’ inquiries? Which apps do you like to use to create their stories? How do your students learn and grow differently by telling stories instead of hearing them? 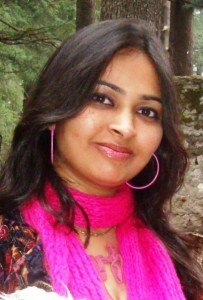 Sana Noor is currently an ICT teacher in the primary wing of Pathways School Noida. This is her fourth year in the PYP curriculum and twelfth in teaching. She is passionate about technology and integrating it with classroom learning. She believes that technology is a huge catalyst in engaging students towards enduring understanding. She is an enthusiastic tweeter and enjoys learning from her PLN. She tweets at @sansanananana. Thank you so much for this, we are looking at story telling soon with K1 and I have found this all so helpful! Thank you for sharing… we are looking for apps that allow students to be creative and you mentioned many! Really enjoyed reading this one,not my strongest skill thus so lucky to have a co-worker who is awesome at it and is patient enough to teach meas well. Do you incorporate storytelling into your students’ inquiries? Always during each unit and during circle time and reflection time. Which apps do you like to use to create their stories? At the moment we are still using hard copies. How do your students learn and grow differently by telling stories instead of hearing them? Confidence. improved literacy levels, creativity and imagination enhancement. Wonderful idea! I will do it with my K students but in Spanish! Thanks Fiorella! That’s a great idea. In fact usage of any language can be reinforced using this great app. I am a teacher in a PYP school. Can I please get your email id so that I can contact you to get your help for some information.